Live apterae of Cinara pruinosa are brown or dark green, sometimes with a bronze metallic tinge. They may have waxed patches along the sides of the dorsum (see first picture below) or such patches may be reduced or absent (see second picture below) (cf. Cinara costata which are wax covered to a greater or lesser extent, with deposits of wax on surrounding twigs). 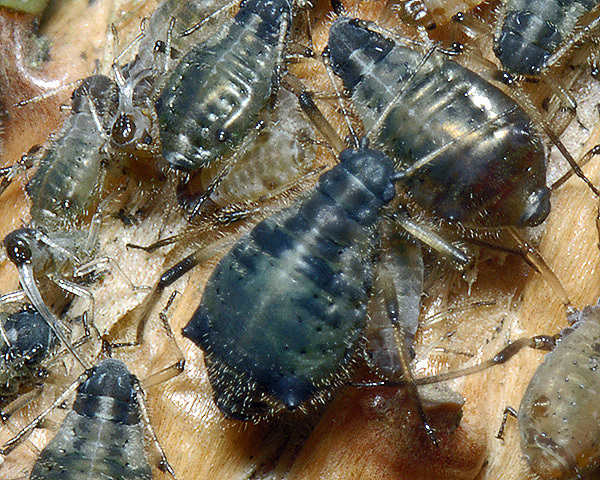 The adults of Cinara pruinosa usually have blotchy blackish markings in a pattern resembling the letter omega (Ω) on tergites 1-3. The two terminal segments of the rostrum are 1.1-1.5 times longer than the second tarsal segment. The legs are conspicuously hairy, with long hairs on the outer side of the hind tibia, all or many of the hairs exceeding 0.12 mm (cf. Cinara piceicola which has only short hairs on the outer side of the hind tibia - less than 0.12 mm long). The tibiae are pale except for the apical one third of the femora, and the bases and distal halves of the tibiae and tarsi. The second tarsal segment is shorter than the maximum diameter of the cones.Cinara pruinosa adults have prominent black siphuncular cones (cf. Cinara piceicola which have usually small and rather faintly pigmented siphuncular cones). The body length of Cinara pruinosa apterae is 2.4-5.0 mm. The Cinara pruinosa alate (see first picture below) is brown or green with a pattern of white wax spots down the midline and along the sides of the dorsum. 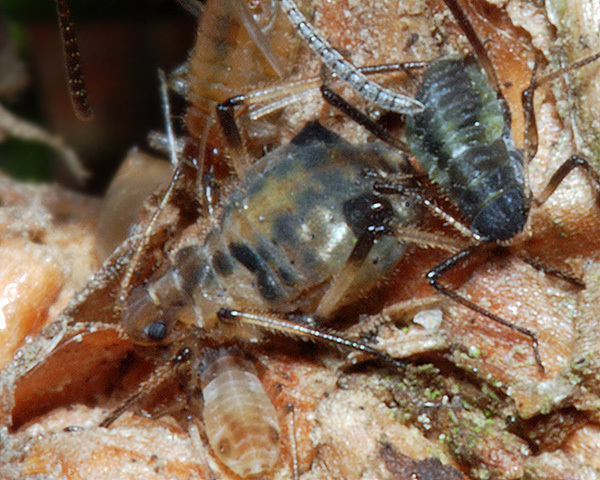 Cinara pruinosa oviparae are somewhat smaller than the viviparae and have a pericaudal wax ring (see picture below in life cycle section). 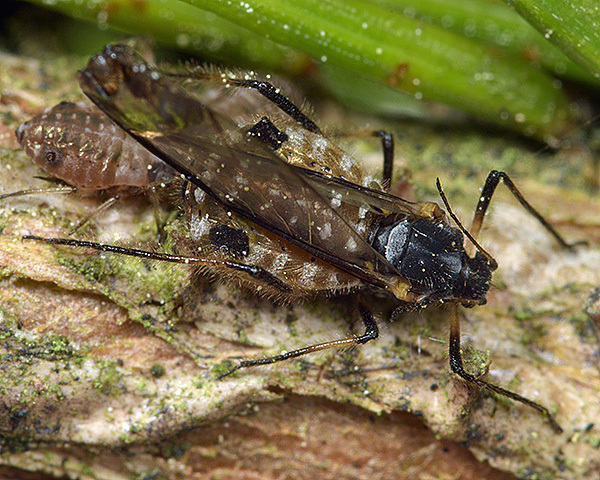 Both alate and apterous males have been recorded (the latter possibly in error). 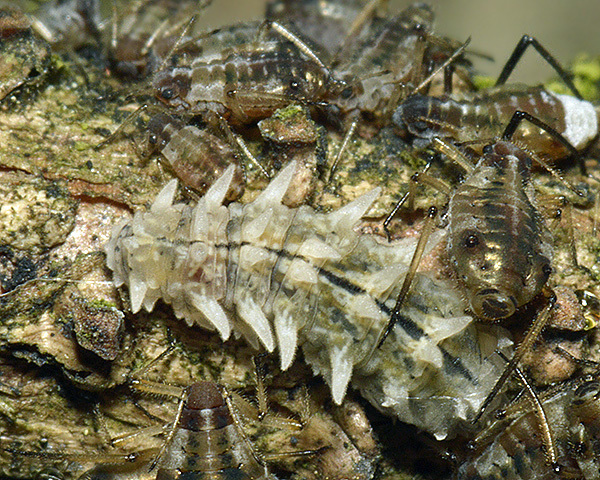 Cinara pruinosa usually overwinters as eggs which are are laid on the bark of younger twigs. Pintera (1966) reports that some apterae overwinter on the roots in chambers specially prepared by ants. Carter & Maslen (1982) report that alates occur from June till August. We have found them at Bedgebury Pinetum, Kent from as early as mid-May (see picture below). Their progeny develop on the lower branches, the base of the trunk or on exposed roots of spruce trees. Very large colonies of Cinara pruinosa can develop on the shaded side of spruce branches by September (see pictures below). 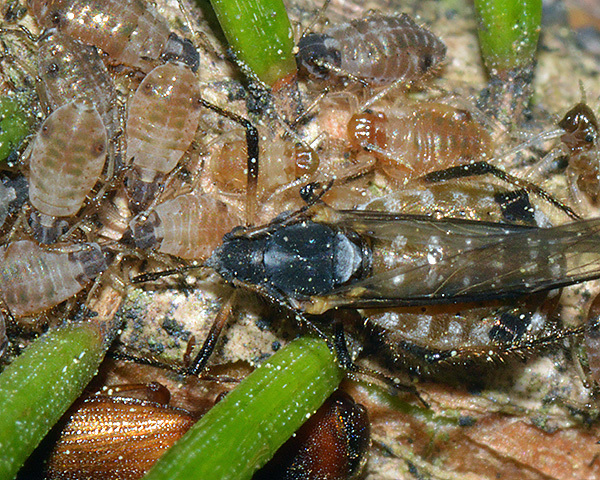 Oviparae with pericaudal wax rings (see picture below) and alate males with prominent black genitalia can be found in October and November. We have found two colour forms of Cinara pruinosa: The green form (see below) somewhat less commonly than the brown form. The ground colour is sometimes yellowish or gold rather than green as shown below. 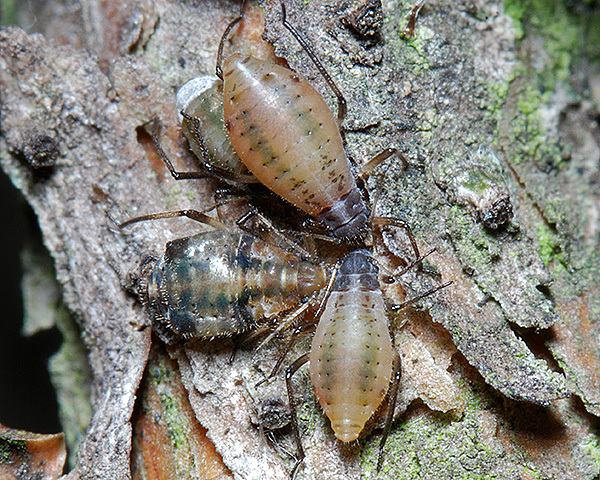 Cinara pruinosa often lives in close association with another species of spruce aphid, Cinara piceicola, sharing feeding sites. 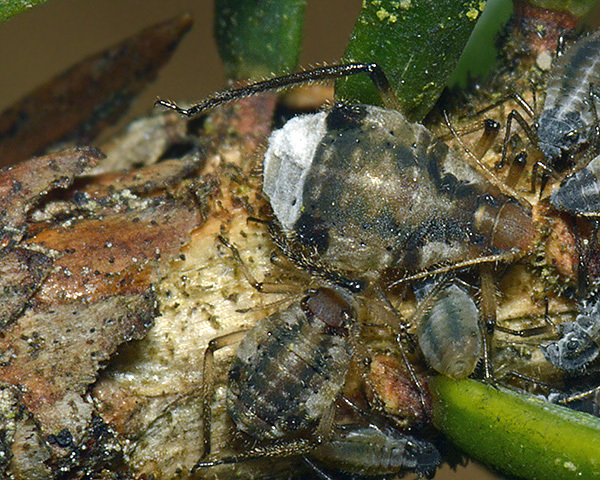 The picture below on the left shows a Cinara pruinosa (the aphid with the prominent black siphuncular cones) with a Cinara piceicola ovipara (with pericaudal wax ring) and two apterae, on spruce in October. 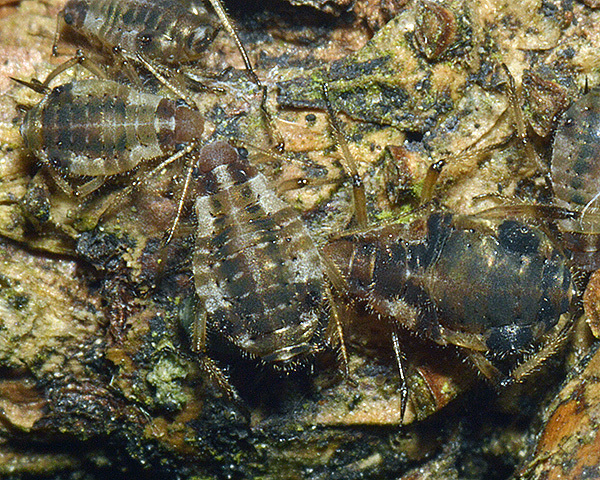 Each species is thought to benefit in this type of association with the group of aphids creating a feeding sink which increases the flow of nutrient to that part of the plant. We have usually found Cinara pruinosa to be attended by southern wood ants (Formica rufa) as can be seen in the picture below. Binazzi & Scheurer (2009) reported that Cinara pruinosa is optionally dependent on ants. In Sweden mixed populations of Cinara piceicola and Cinara pruinosa are attended by the wood ant Formica aquilonia. Johansson & Gibb (2012) compared clear-cuts (leaving 5-10 trees/ ha), middle-aged and mature spruce-dominated stands of boreal forest for the quality and quantity of aphid honeydew obtained by these ants. Wood ants harvested less honeydew in clear-cuts which contributed to a reduction in size and abundance of wood ant workers and mounds. The only predator we have found is the larva of a species of Syrphidae - possibly a Didea species which we have so far been unable to identify. Blackman & Eastop list about 170 species of aphids as feeding on spruces (Picea) worldwide, and provide formal identification keys. Of the 28 aphid species Blackman & Eastop list as feeding on Norwegian spruce (Picea abies) Baker (2015) lists 16 as occurring in Britain: Adelges abietis, Adelges laricis, Adelges nordmannianae, Adelges viridis, Cinara costata, Cinara piceae, Cinara piceicola, Cinara pilicornis, Cinara pruinosa, Elatobium abietinum, Pachypappa tremulae, Pachypappella lactea, Pineus cembrae, Pineus orientalis, Pineus pineoides, and Prociphilus xylostei. 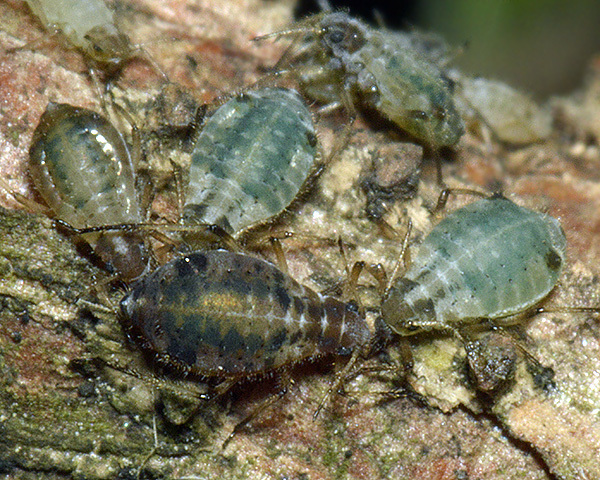 Whilst stressed plants tend to be more aphid-prone, there is some evidence that aphid populations on nursery spruce trees increase in response to fertilizer. Wellenstein (1960) reported that when 5-year-old potted Spruce, artificially infected with Cinara pruinosa, were fertilized with nitrogen, calcium, potassium, phosphorus, or trace elements, aphid populations on nitrogen and calcium-fed plants increased rapidly and then quickly declined. On potassium and phosphorus-fed plants the increase was slower, but greater and more lasting. These mixed species colonies are usually ant-attended so one needs to assess the effect on growth of having both the aphids and the ants. 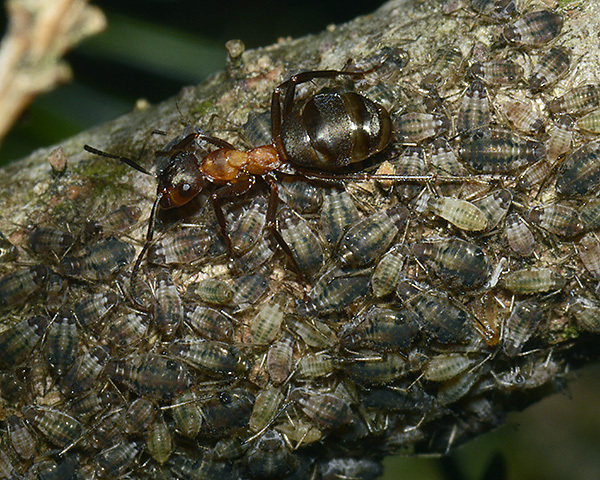 Usually the growth of deciduous trees responds positively to wood ant - aphid mutualism as the ants destroy many harmful herbivores. 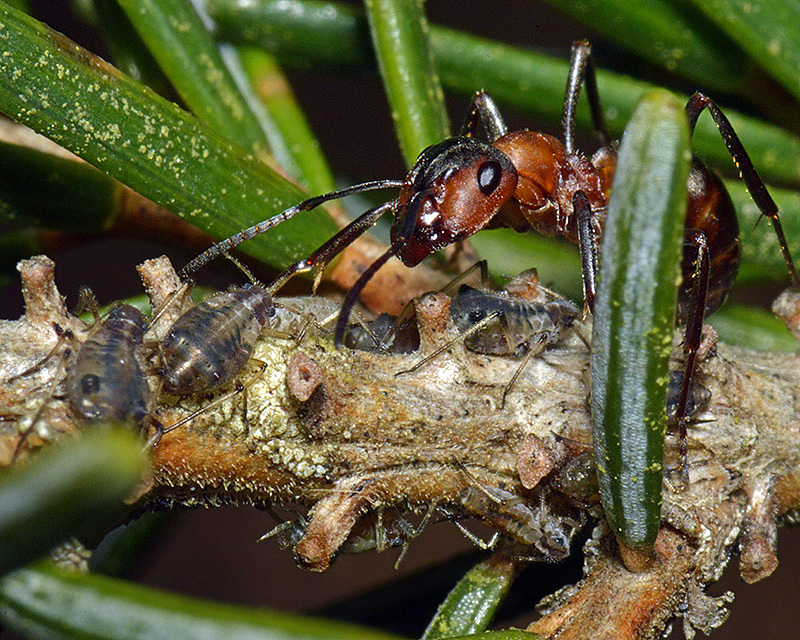 In contrast, wood ant-aphid mutualism has been shown to suppress the growth of Scots pine. 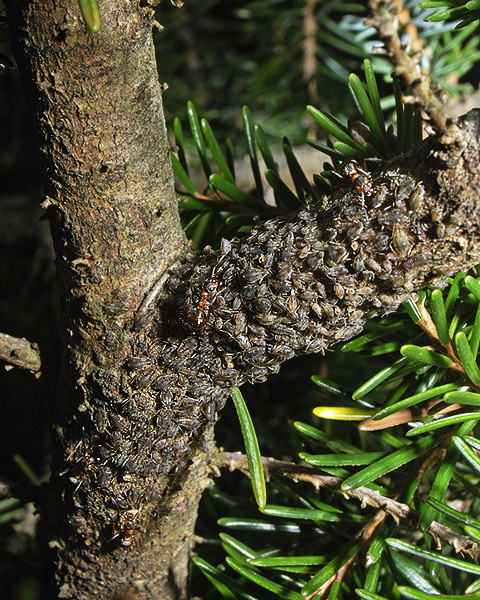 This may be because, unlike deciduous trees, conifers have relatively few defoliating insects. Kilpelainen (2003) found that wood ant-aphid mutualism was associated with a clear positive but non-significant height growth response in individual 5-year-old Norway spruce seedlings, but had a small significant negative effect on the stem growth of individual fast-growing 30-year-old Norway spruces. They concluded that effects at the stand level were negligible, because only a small number of trees were heavily infested. Pintera, A. (1966). Revision of the genus Cinara Curt. (Aphidoidea, Lachnidae) in Middle Europe. Acta entomologica bohemoslavika 63, 281-321. Wellenstein, G. (1960). Ergebnisse vierjahriger Untersuchungen uber die Steigerung der Waldbienentracht. (Four years' results of trials to increase the honey harvest from the forest.) Zeitschrift fur Angewandte Entomologie 47(1), 32-41.